Non-ablative fractional resurfacing has been used in recent years for skin rejuvenation, although it can be very effective, complications can still occur. In Asians, the main complication is post-inflammatory hyperpigmentation (PIH) which is known to be related to the density and energy of the device used (1). An important issue is bulk tissue heating and while this has been frequently mentioned, variables affecting such have not been previously addressed. The degree of bulk tissue heating depends upon several factors including the rate of the energy delivered by the device, the rate of skin cooling and the rate of heat removal by blood flow. 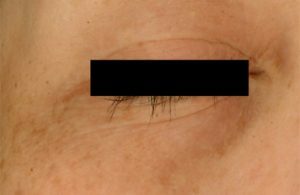 While most operators tend to use air cooling to reduce the risk of bulk tissue heating, complication can still occur in area where the skin is particularly thin (such as peri-orbital or forehead) [Figure 1]. Due to the reduction in skin volume, with other factors being constant, the risk of bulk tissue heating increases. Operators should take this into consideration when performing non-ablative fractional skin resurfacing especially among skin of color to avoid localized PIH. 1. Chan HH, Manstein D, Yu CS, et al. The prevalence and risk factors of post-inflammatory hyperpigmentation after fractional resurfacing in Asians. Laser Surg Med 2007;39:381-5.